In 1997 the Wester Hailes Partnership published its second progress report covering the eight years of operation from 1989. The report reviewed the outcomes to date and looked forward to what might still be achieved, while admitting that the Partnership was now nearing “the end of its designated lifespan”. The report was able to look back on some real practical achievements. In terms of the top priorities set at the outset, housing and the environment evidenced the greatest progress. The stated objectives had been to widen the mix of tenures and types, improve overall physical standards and, in the longer term, make Wester Hailes an attractive place to live thus stabilising what had become, as the report put it, a “fragile community”. In 1989, flats made up 97% of the accommodation in the area (with almost a third of these being in high rise blocks), 95% of properties were owned by Edinburgh District Council (only 3% owner occupied), and many were showing evidence of physical deterioration. Eight years on, the tenure mix had changed substantially with Council owned stock down to 64%, owner occupation up to 21% and housing association properties accounting for 11%. In addition, a tenant management co-op had been established in Wester Hailes Park which comprised a further 4%. By 1997, 1,300 high rise flats had been demolished, transforming the skyline. 850 homes had been renovated (with Wester Hailes Drive winning the accolade of “The Most Improved Street in Britain” in a nation-wide competition) and 600 new homes constructed. The majority of these were built by the recently formed Wester Hailes Community Housing Association but the figure also included the first Low Cost Home Ownership scheme which had been developed by Miller Homes. In addition, “massive environmental upgrading,” had been carried out in Westburn Park and Grove, Dumbryden, Murrayburn and Hailesland. Although the report was able to highlight a decrease in unemployment of 27% in the previous four years, it had actually risen by 25% in the first four years of the Partnership’s life. Moreover, the level in 1997 was 2.8 times the average for Edinburgh as a whole and the gap between the two had actually widened slightly from ’93 to ’97. Nevertheless, the authors of the report felt able to state that, despite the stats, “optimism is higher than ever “. They pointed to investment by the private sector showing “renewed confidence” in the area with over 1,000 jobs created or “in the pipeline” and a new company, the Westside Training Agency, having been established to provide “guidance, training and employment access”. The report calculated that more than 6,000 jobs had been found for local people throughout the city and more than 3,500 training places had been taken up. On the leisure and retail front, the new town centre costing £17 million was now complete, including a redeveloped shopping mall, civic square, multi-screen cinema, community library and bingo complex. Workspace units were being developed by the Wester Hailes Land & Property Trust; a “fitness, social, leisure and entertainment centre” run by the community – the Greenway Centre – was up and running; and “a range of commercial and leisure developments” was planned for the Wester Hailes Park and Drive area. Amongst other initiatives, Britain’s first cyber cafe in a peripheral estate had opened providing access to the internet and “computer skills linked to the workplace”; 20 new safe play areas had been created; and campaigns were being launched to promote healthy eating and reduce smoking, alcohol and drug misuse. A lot had happened, a lot of money had been invested but the story so far was hardly one of unqualified success. Next week we’ll examine the legacy of the Partnership and what, if any, long term dividends it brought Wester Hailes. Following a campaign by Wester Hailes Community Council, funding approval was officially OK’d at a recent City Council meeting for an improved and extended pedestrian link between Westside Plaza and the new Healthy Living Centre. It is understood that the detailed plans for the new link are now currently being worked up and that a revised planning application will be submitted in due course. * The location, extent and maintenance of open spaces. Arrangements are currently being finalised for the erection of Scotland’s first digital totem pole at the corner of Wester Hailes Road and Murrayburn Road. It is anticipated that the pole will be officially unveiled at a ceremony that will take place within the next couple of months. We will keep you updated on this as things progress. The designs of the Off the Wall wall plaques incorporating QR codes which will provide historical information about the locations in which they are situated,including local people’s memories of the places are currently being worked up and it is hoped that the first of these will start to appear within the next couple of months as well. In the last post I wrote about the stories I collected during my earlier research in Wester Hailes. Because of this when this blog and particularly the Facebook site started collecting peoples’ stories I was immediately interested. Just like we saw in Sheila’s story, this is descriptive, has a beginning, middle and end and really captures a happy childhood. On other photos the discussion that people have in the comments becomes a story. As researchers we were unaware of the reputation of the crows in Wester Hailes, so we particularly like the stories of crisps being stolen and people being attacked under this photo of the shopping centre https://www.facebook.com/photo.php?fbid=286043994745300&set=a.286043624745337.91199.197477826935251&type=3. The really useful thing for a researcher like me about Facebook is that you can easily find out who is doing all this chatting and a little bit about them (gender and age, mainly). From this data I can tell you that every Thursday when the photos are uploaded about 100 people start talking about them with the next couple of days. If you look at the graph I have taken from the Facebook site for July below you can see that most of the talking is being done by women, and that most of these women are between the age of 25 and 44. Across the research literature on neighbourhoods like Wester Hailes this is the first time this pattern of engagement with social history has been recorded. This is really exciting and could change how researchers like myself understand neighbourhoods. 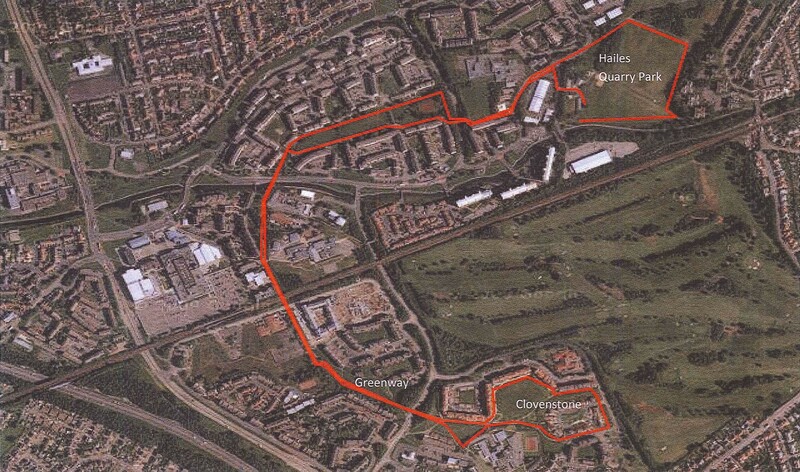 As has previously been reported here https://hailesmatters.wordpress.com/2012/06/14/funding-for-a-new-sentinel/ there is quite an impetus to get a new version of the Wester Hailes Sentinel going again, perhaps along the lines of the North Edinburgh News http://northedinburghnews.wordpress.com and Broughton Spurtle http://www.broughtonspurtle.org.uk/. All this modern technology makes it very easy to create a newspaper as we can “aggregate content” from the other online sources in Wester Hailes like the Facebook page, blogs of organisations like CHAI http://chaiedinburgh.wordpress.com/ and the pages of the Community Council https://www.facebook.com/pages/Wester-Hailes-Community-Council/. If we want this to really take off we also need some citizen journalists to find out what’s happening in Wester Hailes. What we wondered was whether some of those people writing stories on the Facebook site might write stories for the ‘Digital Sentinel’. This presents a really big challenge and one that might not be overcome. In the sort of language I use in my research it means converting “bonding social capital” into “bridging social capital” – or to put it in a much simpler way, persuading people to stop chatting with their mates on a Facebook page to start shouting out to everybody in Wester Hailes! If you have any ideas of how this might be done, do let us know! A couple of weeks ago we highlighted a mystery surrounding the apparent re-naming of Gillespie Gardens when it was first built. Caroline Campbell got in touch in response to say that she has lived in Wester Hailes since 1970. She remembers that when this set of houses was first built, no-one seemed to have a name for them. There were a few to choose from and Alcorn Square was the name finally picked by the developers. In last Thursday’s post about the 1992 Community Map, the year of publication of the original Map was given as 1987. Apologies – it was of course 1983 and the gap between them was therefore 9 years and not 5. This makes the relative lack of change rather more significant, especially when this is contrasted with the 5 year period between 1992 and the third version produced in 1997 (see this Thursday’s post for full details). 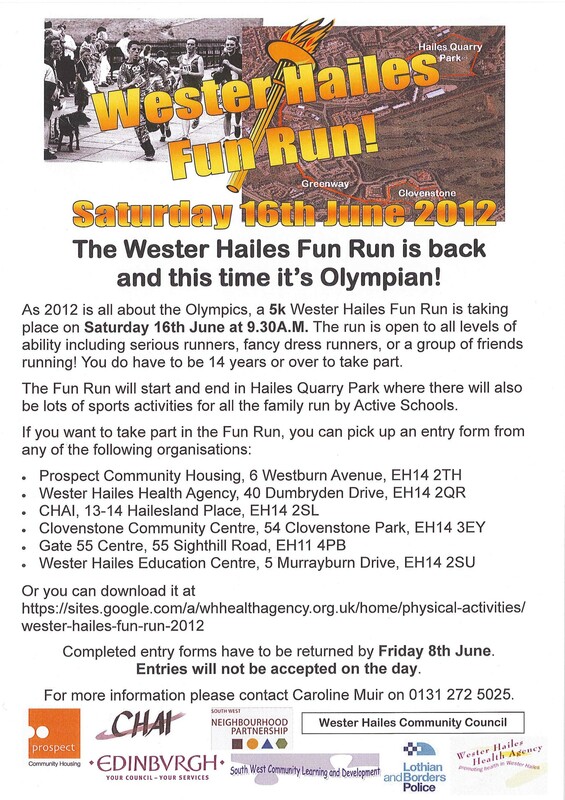 Last year we posted an article about the regular Fun Run that used to take place around Wester Hailes. It caused a lot of debate and discussion locally and there was a feeling that this might be the right time to bring it back. 2012 is the year of the Olympics with the torch travelling through Edinburgh on Wednesday 13thJune. 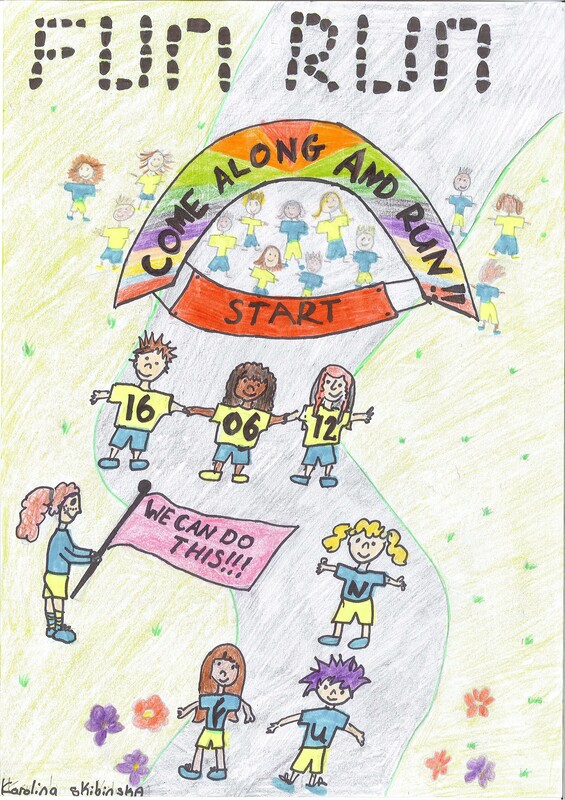 A group of organisations and residents got together and have organised a 2012 Fun Run to take place on Saturday 16th June. race route, including that famous Greenway hill! Meanwhile, in Hailes Quarry Park, Active Schools are going to be organising a Family Sports Day with lots of sports taster sessions for all ages, so that the day should be a day of Olympic celebration. We’re now looking for runners to enter. Whether you’re a serious runner, a fancy dress runner or a group of friends running, why not give it a go! It’s open to all levels of ability and if you need to walk some of it, that’s fine! You do have to be 14 years or over to take part. For more information on how to enter please click here. Please note there will be no entries accepted on the day. If you don’t want to run but want to be involved, we’re also looking for volunteer helpers. And of course, we’re hoping people turn out on the day to cheer the runners on! The Sentinel carried a double page review of the 80s in January 1990 which we featured in a post a couple of weeks ago. Here’s more from that including a further selection of front pages that were chosen to represent the decade. On the political front the paper bemoaned the fact that “a sharp-suited woman of steel ruled over Britain for the whole of the 80s” but was much more indulgent towards another Tory: “we are honoured to have Scotland’s “Governor-General” himself as our Member of Parliament. The Rt Hon Malcolm Rifkind MP has served us well”. The Labour Party was given a mixed review: “at least we had a couple of years of no rent rises. In 1984 the newly elected Labour administration on Edinburgh District Council fulfilled an election promise and froze rents – until they gave into Government pressure in 1986 and rents began creeping up again.”. And then, somewhat of an odd comparison: “in East Germany council rents have been frozen since 1949” – odd because the end of the 80s also marked the pulling down of the Berlin Wall after thirty years as a direct result of huge protests by highly disgruntled citizens.